China launched a new-generation satellite into orbit that will support its global navigation and positioning network at 7:13 a.m. Beijing Time Wednesday. Launched from Xichang Satellite Launch Center in the southwestern province of Sichuan, the satellite was boosted by a Long March-3B carrier rocket. It was the 20th satellite for the BeiDou Navigation Satellite System (BDS), and puts China one step closer to providing an alternative to the U.S.-operated GPS. For the first time the satellite featured a hydrogen atomic clock. A series of tests related to the clock and a new navigation-signal system will be undertaken, according to a statement from the center. Named after the Chinese term for the plough or the Big Dipper constellation, the Beidou project was formally launched in 1994, some 20 years after GPS. 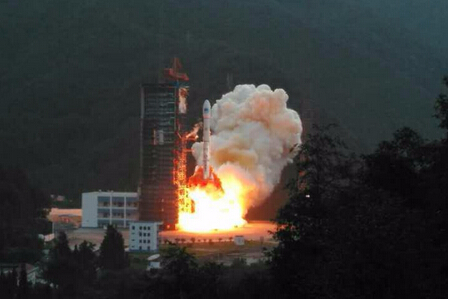 The first Beidou satellite was not launched until 2000. Nonetheless, by 2012, a regional network had already taken shape, which provided positioning, navigation, timing and short message services in China and several other Asian countries. China plans to expand the Beidou services to most of the countries covered in its "Belt and Road" initiative by 2018, and offer global coverage by 2020. China launched a new-generation satellite that will support its global navigation and positioning network at 7:13 a.m. Beijing Time Wednesday.